Geen follows the path that the Wordbearers had taken. After a short rise, he sees the Dhakaani group at the foot of a great airship, beginning to load their supplies onto it. The ranger returns and lets everyone know that the goblins are fine. Yeraa is relieved. The Mourning Day Heroes follow with Yeraa. As they reach the ship, they can see the name: Kordanga. This is the ship that Captain Kalaes told you the Wordbearers hired out. "The Kordanga will take us to Graywall. We should make it before the day is out. Then we can collect Murkoorak's Orb and the pieces of Arkantaash shall be reunited once again!" OOC: It will be a few days until everything is fully ready, but we can RP in the meantime. If you need help remembering what has gone on, I have it summarized here. I still have to add the stuff from the Six Kings dungeon, but it should remind you of all the earlier stuff at least. Below is the status of each character at this point at level 5 (except Kurvilis, whom I don't have). Also, the links go to the updated wiki pages. And, technically there was no extended rest, but I think it is easier if we play as if there had been one. Geen smiles when he sees the ship. He has always marveled at the complexity of such a vehicle. He awaits his fellow companions before heading onto the ship. He smiles, shakes hands when offered one to shake, but mostly remains silent. Sentinel quickly looks over the ship. Bound elemental, spells of abjuration protecting the hull, and then he feels a sudden fleeting and surprising sense of affinity for the vessel. Memories flash back to his past, early memories from when he was but scant months old; some peasant but many disturbed. He looks to Kurvilis, as if afraid the memories had stolen his friend. Khav boards the airship, hoping not to be attacked this trip. Everyone loads onto the airship. It is moored to the cliff face by a tight web of ropes and lanyards. The crew is a mix of humans, goblins, and hobgoblins, including a single half-elf with the Mark of Storm on his forearm. Tikulti moves up to Yeraa and says, "We have just defeated some Emerald Claw. No one was hurt, but the ship was damaged. Captain Delan says it will take a day or so to repair." "Hmmm...that is troubling. We just defeated some of their handiwork near the cavern entrance. Very well. We will help as they need it and stay with the ship." Turning to the five of you, Yeraa says, "There is a slight delay, but it will still be faster than traveling to Graywall on foot. Feel free to help or just rest. We have hired this ship, so you do not need to pay for passage." OOC: Feel free to talk to any of the Wordbearers or the crew of the ship as you wish. OOC: I have fully updated the story summary to this point. You can follow the link on the first post to this thread to get there. Lan nods. "I will be happy to aid as I can. Although I will be more likely to settle squabbles and coax more work out of everyone than being useful with my hands. Just let me know how I can help coordinate everyone." The Seekers quickly find their quarters in a converted cargo hold. Placing their equipment there, they hang around outside the ship, helping minimally, but keeping watch in case more attackers come. You hear the crew talking about how bad the Emerald Claw archers were, since the only thing they could hit was the broad side of the airship. The Wordbearers and Mourning Day Heroes spend an uneventful night together with the crew of the Kordanga, making sure to keep lookout in case the Emerald Claw return. In the morning, the airship lifts off and you see Six Kings in all of her majesty from above. After about an hour, you see a faint pall of smoke along the western horizon. At your side, one of the crew confirms that this is Graywall, about two hours out. While in the air, watching the terrain change beneath you, and seeing occasional travelers along the roads, Yeraa comes up to you. "Dhakaani ruins are the deep foundations of Graywall, and it is there that our seers say Murkoorak's orb lies. Rumor and legend place it beneath what has become the Calabas. Now, the circlet will show us the way." She removes a golden and mithral circlet from her pouch and shows it to you almost in secret, carrying it with reverence. About 3 hours into the flight, Graywall passes below you, a mass of stone buildings and canvas workers' shelters obscured by the smoke of wood fires and furnaces. The wall that surrounds the town shows signs of recent and ongoing construction. To the west rise new buildings; to the east are great quarries where stone is cut. Ahead, your destination is the foreign quarter, called the Calabas, or, as the locals refer to it, "the Kennel." Khav remembers that House Tharashk has a large presence in the city and acts as the local security. "If we get into trouble - okay, when we get into trouble," Khav corrects himself, "we might be able to contact my House for assistance. Lets try to keep it from getting to that, though - in the end, a House does itself favors, not its members." OOC: Viktor or Gary, can I ask one of you to help me level Kurvilis? Having never been aboard an airship before, Geen is a bit anxious and nervous. Is is very noticeable that he stays away from any of the railings, in fear of possibly falling. By the time Graywall is passing beneath, Geen's curiosity gets the best of him, and he edges near a tall railing to peer out & below. His breath is taken away, and he almost reels backwards, as if pulled from a river like a fish on a hook. He steadies himself, holding the railing very tightly, and does his best to satiate his desire to see the great vista lying below him. After landing, Yeraa pulls out her circlet and begins walking in a direction. For the better part of a day, you walk the foreign quarter with her and her seekers. She seems to be guided by the circlet. In the end, you find yourselves led to a great public plaza. This is the Roar, named for the House Tharashk dragonne statue at its center. OOC: Technically (and I know this was a long time ago), you were on an airship on the way to Six Kings...about a week in game time. However, it is perfectly reasonable to still be motion sick by this. If you guys want to do any shopping, make skill checks, etc. Now is a good time to do it. This is a decent sized marketplace. If all of you want to move on, please at least check in. "Charming city." comments Lan with a sardonic smile. Focusing your thoughts allows you to move with blurring speed to stay one step ahead of your enemies. While you are not bloodied, you gain a +1 item bonus to speed. Trigger: You hit an enemy with an unaugmented at-will attack power. Effect: You shift 2 squares once the attack is resolved. Level 13: shift 4 squares. Level 23: shift 6 squares. Josh, I also updated my wishlist to make it simpler. OOC: I am going to post later tonight and Viktor, you certainly have enough money to buy that. Although, it seems like that would probably be learned, rather than bought...sort of a weird thing to put a price on. I will figure out the group's gold and actual experience and a few other things during my winter break. New post to come shortly. Yeraa stops suddenly in a space between two tents. "This is it," she whispers, but when you look around, she taps her blades on the cobblestones. "Below. Two hundred feet or so. The orb is buried here." All of you return to the Kordanga where Yeraa consults an old map. It indicates that there is an ancient goblin shrine buried beneath The Roar. You need to dig straight down...in the middle of the busiest part of town. We should set up a fake merchant shop. "While we," she indicates the Wordbearers, "dig down and find the orb, you," she points a knife indicating the five of you, "can pretend to be merchants and distract from us while giving cover." First, you must come up with an idea to for a merchant stall to place in the center of town. Then, you will be required to distract the people in the market from the digging. Before the challenge starts, you need to come up with an idea for the stall. "Well, we could pass ourselves off as a foreign correspondence crew or perhaps as a crew of documentarians gathering geographical and sociopolitical information from various regions, maybe planning to publish an encyclopedia eberronica. That might explain why such a disparate group of people from different races would work together, as well as our inquisitiveness. I would naturally be the lead organizer, responsible for public relations and such, our faceman if you will. 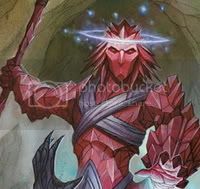 Sentinel could be our dataman acting as archivist and historian, Geen our natureman acting as expert on flora and fauna, Kurvilis our magicman acting as esoteric expert, and Khav our muscleman acting as bodyguard." "Hmm, Lan. I mean no disrespect, but I am an official archivist for the Library of Korranberg currently on field assignment. My current job is to collect and categorize the life, conditions, and thoughts of the various Warforged in post war Khorvaire. Kurvilis has been assigned as an equal in this endovor. He also serves as a breathing liaison if you would. Some places are still fairly hostile to myse..Warforged... That I've taken such an extreme detour hasn't relieved me of this duty. It's been a fine chance to quickly travel to locations which would normally stress my budget. I would appreciate it if Kurvilis and I could continue our mission. We could be a merchant in reverse if you would, seling gold in exchange for time..."
Lan winks mischievously at Sentinel as he responds. "That sounds like a fine idea my mechanical friend. Naturally, I'm sure, the Library of Korranberg will have given you sufficient funds to use in exchange for archival worthy information. If you and Kurvilis front the gold, we'll be your front. However, acting as information seekers will not explain the ruckus caused by the digging below. Although...." Lan ponders then grins lopsidedly. "....Kurvilis has a crazed air about him from time to time so maybe we could be digging a cellar for some of his mad experiments." You return to the market about midday, hoping to rent a market position directly over the dig site. At the entrance to The Roar, you find a booth called Market Information. A gnoll stands there and asks, "Can I help you?" in a rough voice. You can see a board behind the gnoll that says, "Market Space Rentals - Basic: 10 GP; Normal: 20 GP; Large: 30 GP." "Lan, I had rather hoped we could work out a means of using party funds to aid in the cover operation. Sadly, the Library has provided a most lean expense account.. no doubt under the assumption I require neither food nor lodging. THey seem to have forgotten that I do need a place to read and write without rain and wind destroying or stealing pages. Perhaps we could use the stall rental form communal property, and my personal share for the Library's business. Perhaps we can use my legitimate needs for information gathering as a secondary purpose to the business venture. Having a veneer of truth always helps a white lie." In his clearest Common, Sentinel addresses the gnoll. "Hello. Please furnish specific dimensions and durations for your listed rental disbursements." The gnoll answers, "Basic: Covering, walls, and tables to display goods in a small area. Fits two people tightly inside. Normal, same materials to cover a larger area. Fits four people inside. Large, same materials to cover area to fit up to 10 people. Special accommodations cost more. All rentals cover one night. Locations are by first in place." "I think a large space should do the trick," Khav says. Eyeing the gnoll, he asks, "I would imagine members of House Tharashk are afforded certain privileges, yes? First placement, or something of the sort?" "Proof? If House Tharashk wanted to set up shop, already would have. Besides, still early, not many booths. Lots of good spaces open." OOC: The smallest is one square, medium is 2, large is 4. I figure that people running shops can fit more than 1 per 25 sq ft. Also, you don't have to have everyone in the booth all of the time.